Wake up your lawn with fertilizer and protect it from weeds with pre-emergent. 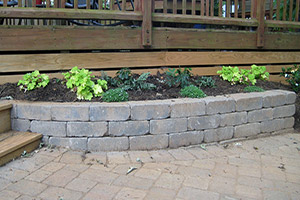 Update your curb appeal with new shrubbery, colorful perennials & annuals or some metal edging. Want to enjoy your beautiful yard without getting eaten alive by mosquitoes? Woodson Landscaping is certified in mosquito control and offers plans to rid your outdoor space of dangerous and annoying mosquitoes. Have weeds invaded your lawn? Has fungus or brown patch overrun your grass? August is a good time to treat these problems before fall aerating and seeding. 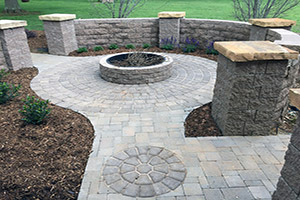 Summer is also a good time to think about entertaining with a new fire pit and sitting wall. It’s time to install those new shrub and flower beds we just designed for you! Now that your lawn is weed free, it’s time to core aerate and over seed! Fall is also a great time to think about trimming shrubs and preparing your perennials for colder weather. 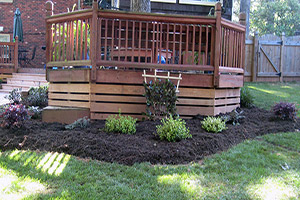 Get beds ready for spring with pine needles or mulch! Early winter is a good time to feed your lawn and late winter is the ideal time to start pre-emergents. We offer hardscape design and installation. Patios, walkways, retaining walls and fire pits of any shape or size. We custom build them to suit your needs! 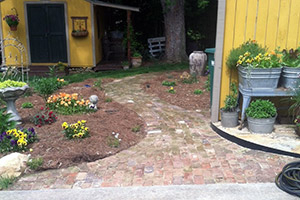 Whether you like natural stone, clay brick or concrete pavers we can create your dream back yard! Whether you’re looking to add to your existing landscape or want a complete overhaul, we can design and install the plants you’re looking for. If you want your beds to really shine, think about adding custom LED lighting. Timed direct lighting will really display your new plants and light up your walkway! We offer individual weed treatments and yearly plans with various payment options. We also offer mowing services weekly, bi-weekly or by request if you head out of town! We take care of the mosquitoes so you can enjoy your yard! We cover your year round landscaping needs!